(Newser) – Al Franken apologized today and said he feels "embarrassed" and "ashamed" of his behavior in light of recent accusations of sexual harassment, USA Today reports. At a press conference outside his Senate office as he returned to work, the Minnesota senator told reporters, "To all of you I just want to again say I am sorry. I know there are no magic words I can say to regain your trust and I know that's going to take time. I'm ready to start that process and it starts with going back to work today." 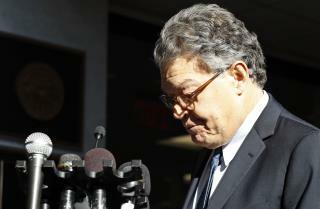 Franken also said, "This will not happen again going forward." At least four women have accused Franken of inappropriate sexual behavior. Stuart's "shame spiral" begins when his cable-access show, Daily Affirmation With Stuart Smalley, is abruptly canceled.